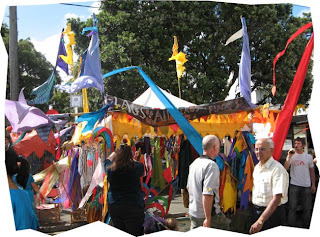 More than 250 stalls and international food take centre staged last sunday for 12th Newtown Festival Street Fair with 5 music stages. Central Riddiford st. and Constable st. are closed to vehicular traffic. What I like with the festival are souvernir items are very cheap to buy with good quality. Many of the local restaurants served delicious food outside supplied fresh from their kitchens and colourful costumes and dance all day entertainment is provided by community groups. So ,see you next year for another Newtown festival. « Gay on the Go! !